Jon first joined Radio Hillingdon in 1991 and over the years has been Station Engineer, Premises Manager, Committee Member, Fund-raiser and of course a presenter. He has always had a close association with music over the years, firstly at school and then as a mobile DJ in the 1970's and 80's. He also still DJ's at a local restaurant in Ruislip. 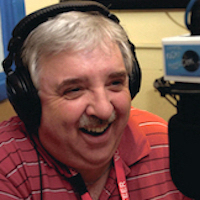 One of his greatest achievements during his time at Radio Hillingdon, was taking part and presenting for 25hrs non stop, in the 100 Hour Broadcast Marathon both in 2007, 2010 and most recently in 2013. On each occasion he helped to raise a lot of money for not only the radio station but other local charities. Jon's full time job is an IT consultant for IBM where he has been employed for over 35 years! Jon's other interests are anything related to music and Hifi, gadgets, real ale, DIY and as Dads and now Granddads' taxi! Jon now presents Friday's Midnight Caller hour from 11pm to Midnight - Smooth Jazz, Information and Conversation.